Whether you like to decorate hard boiled eggs, blown eggs or heck, even plastic eggs, I’ve got a fantastic way to make your kid’s Easter basket brimming with a rainbow of colors…and character! Every year I love to decorate eggs with my kids! Since we like to admire our hard work, we usually do paper mache eggs for display. But we still dip a few hard boiled eggs in dye just for traditions sake. Or peel them and do THIS to them. The Instant Pot has been GREAT for making easy to peel eggs (5-5-5 anyone?) but if you don’t have one of these miracle cookers, you might want to try this fun little hack for perfectly peelable eggs. You can’t mess with perfection–here’s my perfect time tested egg dye recipe! Want to avoid using food coloring on eggs? Here’s directions for Naturally Dyed eggs using beet powder, blueberries and spice! Have you ever wanted to try shaving cream to decorate your eggs? Here’s how! This technique uses blown eggs dangled from a string to make brilliantly colorful eggs. Drizzle your dye over regular hard boiled eggs or paper mache eggs. 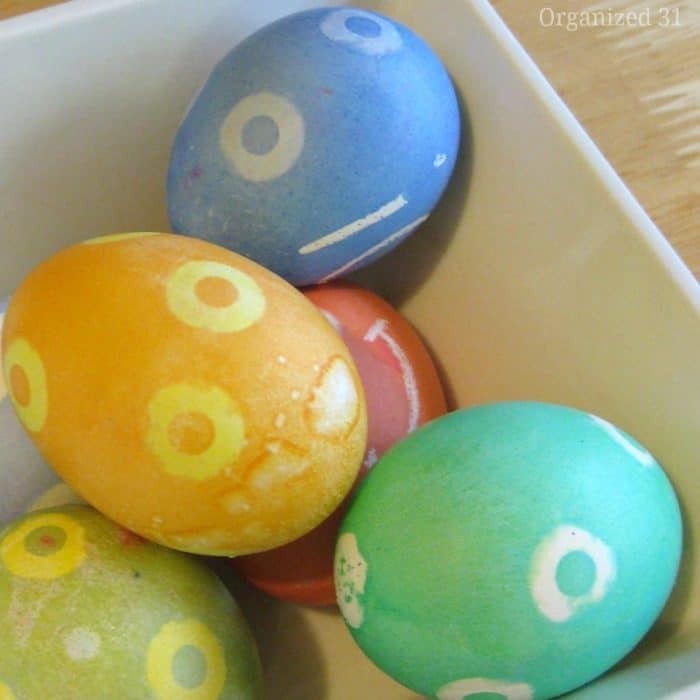 Here’s a great hack to form perfect polka dots on your traditionally dyed eggs! Make cool silhouettes on your dyed eggs using this trick! Love brown eggs? Here’s tips on how to turn them into great Easter Eggs! Dye or paint your eggs yellow, then use Simple Every Day Mom’s printouts to give your eggs some Minion style. If you’re a Star Wars fan, check out her droid eggs here. Another one from Simple Every Day Mom, but with printouts for your favorite Disney characters. Tired of getting dye all over the counter? Here’s directions on “painting” your eggs with markers and a tip to help you keep them forever. Decorate Easter eggs with the same technique Eric Carle used for making the Very Hungry Caterpillar: Decoupage! Great for using on paper mache or wooden eggs. You’ll want to keep these eggs for a while, so break out the paper mache or wooden eggs! Slip a few of these cuties in your next Easter Egg hunt for a special prize! Instead of stuffing plastic eggs with candy, fill them with crafting supplies to turn the egg into a chick! 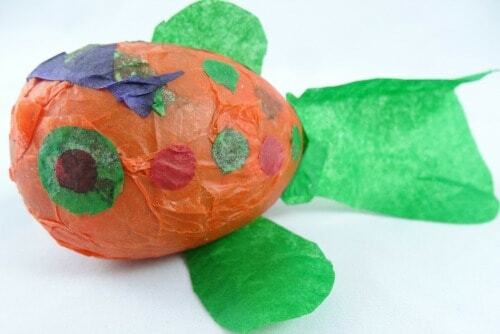 Decorate plastic or craft eggs with tissue paper and make them look like your favorite story book characters! This one uses blown eggs, but you can cut the mess (and prep time) by using paper mache eggs. Add a little nature to your spring time with these eggs decorated with natural materials picked up on a hike. Super cute chicks make with wooden eggs! 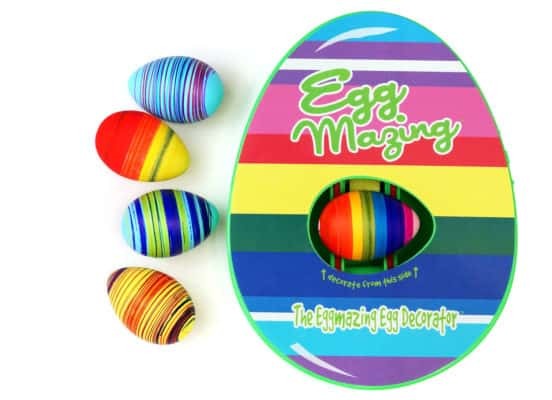 Use this cool gadget to put stripes on eggs–without any kind of mess!